If you’ve watched ESPN lately, you would think the Vikings were the 1980 U.S. hockey team getting ready to face the Russians. I haven’t heard anyone on ESPN pick the Vikings yet and honestly the love-fest is getting sickening. Remember how amazing and unstoppable everyone thought the Saints were, until the Cowboys went in there and beat them? Now all that energy and slobbering of the Saints has been transmitted to the Cowboys. A lot of so called experts have stated that the Cowboys have found their running game again. Here is a list of the teams they played during their last seven regular season games, or since the poor showing in Green Bay. Defensive rushing rank is listed in parenthesis. As you can see, they obviously faced some tough defenses against the run during the same period they ‘found’ their running game (harn). Oh and by the way, the Vikings were ranked second in the regular season for rush defense trailing only their rival Green Bay, who Dallas lost to. Obviously a teams rush defense doesn’t mean everything but I wanted to point out how Dallas conveniently ‘found’ their run game against some not so tough competition. The Cowboys got to the Vikings matchup this weekend by beating the Eagles two games in a row. It should be noted that Eagles starting center Jamaal Jackson was injured and didn’t play in either game. His absence after 71 consecutive starts should not be overlooked and no doubt gave Dallas an advantage in the trenches. The Cowboys deserve a lot of credit for going into the Superdome and manhandling an undefeated Saints team. They beat up the Saints and made a potential MVP Drew Brees give away 3 turnovers (2 fumbles, 1 Int). If they hadn’t gotten to Brees, I think the Cowboys lose, don’t gain confidence, and don’t even make the playoffs. Brett Favre has an 0-3 record against the Cowboys in the playoffs. If anybody thinks that matters, they should have their head checked. Those three losses came against the Cowboys in dynasty mode (I think) and all were played in Dallas. Also one should note, those games were played during the Clinton Administration and are as relevant now as Emmit Smith is to the NFL. Here are some things relevant to Favre and the Vikings today. Favre had highest passer rating of his career this season (107.2). 33 TD vs 7 INT are career best spreads. Favre is playing inside where he is warm and undefeated this season. No doubt the Vikings face a talented foe in the Dallas Cowboys this weekend. The keys to the game are obviously the play of the line on both sides (off/def) on both teams. Percy Harvin should have a huge game against the Dallas linebackers if Favre has time. Hopefully the Vikings play Antoine Winfield more in Nickel and start Benny Sapp. Winfield is not the same after a foot injury and at least Sapp has some speed, which is needed for Miles Austin. I’m not worried about Drops MacGee (Roy Williams), nice trade Jerry. After watching the BCS Championship game, you can see where Drops MacGee got his hands as the LongHorns receivers did nothing to help their freshman quarterback. I also hope the Vikings run more Nickel so we have better matchups against Jason Witten. If he goes against rookie Jasper Brinkley alot, the Vikings may be screwed. While the national media gives absolutely no love to the Vikings and the Cowboys are a great team, I’ll pick the Vikings to win at home in The Dome, 24-17. P.S. Walt Anderson’s officiating crew is calling the game. According to Wikipedia, he is a lifelong resident of Texas and currently resides in Sugarland, TX. I have no evidence of favoritism, but hey, nice conflict of interest NFL. « Pat Robertson should offer his legs to Haiti. Good point about Walt. Where, however, is he from in Texas? He may not pledge allegiance to the Cowboys. Most likely, but possibly not. As for the game, this is one of those games where the Vikes are either destroyed or they play close and effectively all game. 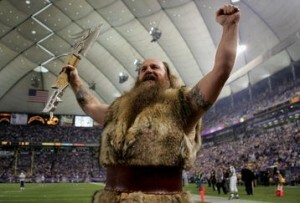 Lets hope against the lame duck, mistake prone Vikings. Sugarland? Maybe he is a Texans fan (probably not), haha. As big as a Cowboys fan as I am, I really do hate how ESPN has just brushed off the Vikings as if they were the Lions or the Browns. (this is one reason why i’m not a frequent espn watcher) I’m really looking forward to a fantastic game out of this. The amount of respect that favre and romo have for each other is enormous so I’m pretty anxious to see how it’s going to come out.